Happiness Project#46: Classic Peanut Butter Cookies! Alright! Alright! 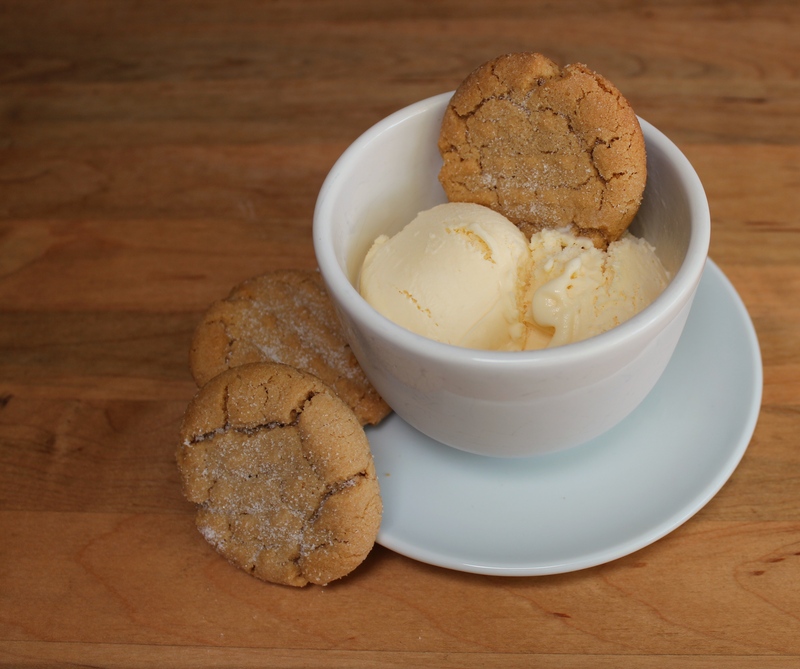 After 3 of my friends contacted me within this past month, asking for my well-loved Peanut Butter Cookie recipe, I’ve finally decided to blog it out for them, and well, everyone else, too. Just so I can make finding it (& keeping it) much easier for everyone interested, myself included. Since we all know how crazy a Mother’s life can be during the holiday season, after all. Without the extra madness of hunting down one’s favorite recipe. The story on this forever favorite home cookie of mine? Years and years ago, before I had gone to Pastry School, I wasn’t able to bake ANYTHING without burning it. Especially cookies. Just between you and me, I couldn’t bake a decent enough cookie to save my life. I didn’t have the patience required, at that point, to truly LEARN and FEEL the craft of baking. Because once you’ve discovered the passion for kitchen wizardry, all you really need to be truly good at it, is the patience to learn the basic baking techniques needed within any staple recipe and the importance of practice. Practice truly does make perfect. Trust me. You have no idea how many hours of the night that I’ve spent in my tiny, little kitchen, re-doing a recipe over and over and over again, until I got it just right. That’s just how it’s done, my friends. Anyhow, after tweaking this cookie recipe 3 or 4 times, I finally got it just right. Being the super pastry snob that I am, after all. *wink* So from my kitchen to yours, (& all of those 3am baking sprees), here it is! Preheat your oven to 370F. Dust two baking sheets with granulated sugar or fit with a Silpat baking mat. Seriously, people, go out and buy a Silpat baking mat! It will make all of your baking experiences so much easier (& cleaner). Just do it! In a large mixing bowl, by handheld or stand mixer, beat the butter and peanut butter on medium speed for a few minutes, until fully incorporated. Add in the granulated sugar, brown sugar, baking soda and baking powder and mix well. After scraping down the sides and bottom of the bowl, add in the egg and vanilla extract. Slowly, beat in the flour until just incorporated. Chill your dough for 10 to 20 minutes (especially, if it’s too soft to handle), until it’s firm enough to shape. If you’re planning on using fun cookie cutters, let the dough cool in the fridge for 30 to 45 minutes so that’s it’s stiff enough to roll out evenly. *Tip: most cookie doughs will gradually warm up when being handled for extended periods of time, so don’t hesitate to pop the dough back into the fridge to cool again between filling up each cookie sheet. Now comes the fun part. Let’s get rolling! By hand (or small cookie scoop), roll the dough into 1-1/2 inch balls. Roll each ball gently into reserved granulated sugar until fully coated. Place up to 12 cookie balls onto each cookie sheet. Using a fork, gently flatten by making crisscross markings. Pop the cookie sheet into the oven, one sheet at a time, and bake for 8-9 minutes, until the bottoms are slightly browned. Remove from the oven and let rest on the cookie sheet for a few minutes before transferring them to a wire rack. Sprinkle or dust lightly with more (yes, more!) granulated sugar. Though you don’t really NEED to add more sugar. They’re quite yummy as is. I personally just really like that extra pop of sugar on top! Never said I was sensible now, did I? Ha! There you have it, all of you cookie monsters! The best of all things classic! Happy Baking! P.S. DO NOT consume these cookies if you’re trying to avoid yummy, sugary temptations. This cookie is NOT at all a good addition to my own Menopause diet. Trust me. « Happiness Project #45: Turkey Pie Croissant Buns! Proud wife of the man of my dreams, childrens lit specialist of 17 years & inspired lover of food photography, after completing Pastry School in the Spring of 2012, I discovered that I had a voracious appetite for kitchen wizardry! And since becoming a Mom last year, I've realized that finding the appropriate time for experimentation is now best done very late at night, when my Sweet Pea is happily a slumber. Which requires a certain amount of stealthiness, indeed. Thus far, here are some of my favorite recipes! Share & enjoy, my friends! Not on WordPress? Never fear! Enter your email address here to follow my blog by email. Happiness Project#89: Apple Cinnamon Cake! The Stealthy Book Nerd: Reviews! The Stealthy Book Nerd Reading List! Summer with Mia! The Stealthy Book Nerd Review: 2017 FAVORITES! The Stealthy Book Nerd Review: March Favorites! The Stealthy Book Nerd! Review: RED QUEEN by Victoria Aveyard!